146 James Street, Bridgeton, Glasgow. Demolished. 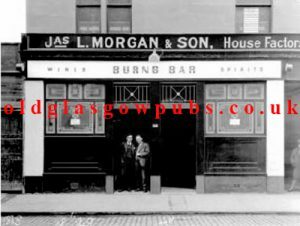 James Durward owned this pub in the 1930s, he continued as licensee for thirty years. In 1968 John Kenneth Dunbar took over the licence. When the building was condemned the Dunbar family removed to Landressy Street, just around the corner from the pub, this pub still operates today and is known as the Keystane. I passed here a month ago an see the pub closed, I enquired about it, the locals say the pub is to be demolished to make way for a new block of flats. Another reminder that today the pub is less valuable to developers than the ground it sits on. The Keystane’s has now closed for good. Like many pubs in the city, the ground that the pub sit’s on has more value than the pub it’s self. New houses will take the place of this pub. Do you remember this old Pub? If so please leave a comment.